• Memorize the state capitals? If you can, and have a little spare time, you can be part of the Prime Time Tutoring Center at the Lincoln Public Library. It’s a volunteer job, but it pays dividends, as the tutors there will tell you. "There’s a direct correlation to how much a person reads and how much he continues to learn lifelong. It’s a beautiful thing to think I helped a third-grader read. That’s a gift to me," says Allison Lindemann, an AmeriCorps volunteer. Aubrey Smith, a student at Lincoln Christian College, doesn’t get credit in any of her classes for the tutoring she does, but she finds other benefits. "It’s a stress reliever just to spend time with somebody who’s learning." She smiles at her student. "And it’s wonderful to see the look on her face when she gets something." Michael Plummer, another AmeriCorps volunteer, who just came to Lincoln from Alaska, is doing volunteer work with young people in many areas. He works with special needs students at Lincoln Community High School and with Project Read. He likes the flexibility of the Prime Time Tutoring Program, and on this particular day he has chosen to tutor a student sitting on the floor in a back corner of the children’s section. This quiet corner helps his student stay focused on the task at hand because there are no distractions. "I like to work with kids, and this allows me to wear many different kinds of hats," he says. Mary Leesman of Hartsburg is an adult tutor, and she sits with her third-grade student at a child-size table while he learns to count change. "I saw a sheet at the Recreation Center about tutoring, so I signed up," she says. "It’s a nice feeling to work with children again." Mary’s own two children are both in college, and she doesn’t have any grandchildren yet. She thinks tutoring is a good idea for those who like young children and are "between children and grandchildren." The tutoring center now has 14 students and 11 volunteers but is expecting more students soon. "We usually get quite a few calls after the first report cards come out," says Pat Schlough, children’s librarian. The calls are mostly from parents, but sometimes they’re from teachers who call because the parents want their child to have tutoring. Tutors are not teaching children new skills, Schlough says, just helping them with homework, encouraging them to get it done, answering questions if a child didn’t take in all the information at school. The center has textbooks from District 27 schools in case children forget their own. 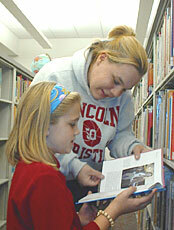 Tutors also use reference books and the Internet to help students get information for reports and other projects. "We match up the tutor to the child," Schlough says. "We ask tutors what areas they are comfortable with. Some are not comfortable with science or sixth-grade math. "We sometimes have students waiting for math tutors, and if there’s anyone out there good at math who would like to tutor, we’d love to have them." Tutors not particularly strong in math are also needed, says Cindy Harris, coordinator of the Prime Time Learning Center, because many students also need help with reading comprehension. "Reading comprehension and math are the areas most asked for," she says. The tutoring center works with students in grades two through six, with occasional exceptions for students in other grades. Most youngsters meet with tutors twice a week, but some meet more often. Students may come from any Lincoln-area school. Tutoring starts about 3:30 p.m. when schools are out, and goes until 6 p.m. 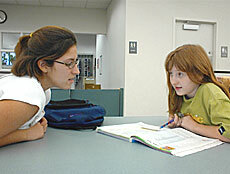 Many tutors this year are from Tri-County AmeriCorps, while others come from college, such as LCC. The tutoring program has also had retired teachers and senior citizens. Many of the young people who are tutoring this year want to work with children as a career. 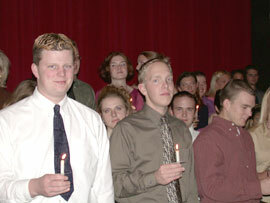 LCC student Beth Edgington wants to be a teacher, while her roommate, Aubrey Smith, wants to be a children’s minister. Michael Plummer hopes to start a therapeutic wilderness program for at-risk youth, the kind of project he once did for AmeriCorps." Parents are generally enthusiastic about the program, Harris reports. Jill Struebing says tutoring has really helped her two children. Her third- and fifth-graders recently switched schools and were a little behind. She describes both of their tutors as "very good." Tina Johnson, whose daughter comes to the program, also just moved to Lincoln. "It’s getting harder for me to help with homework," she says. "Math has changed so much since I got out of school." She thinks it is easier for her daughter to deal with a tutor closer to her own age, one who has learned the material more recently. The students seem to like it, too. They appear to be comfortable with their tutors, not afraid to ask a question or share an idea. For example, third-grader Jacob shares his enthusiasm for the story of the Titanic with tutor Allison, reading to her from a book he has brought. "My tutor is nice," he says. Sixth-grader C.J. holds up some treats he’s earned from tutor Michael. Michael is helping C.J. with reading and describes him as "really good" at math. Harris, who has been coordinator of the tutoring center since January of 1995, is happy with the program and with her current group of students and tutors. "For the last couple of years I’ve had really good kids. We have no problems getting them to come in or do their work. And we have a lot of repeat students from past years." To become part of the Prime Time Learning Center, call the Lincoln Public Library at 732-8878 and ask to speak to anyone in the children’s department. Lincoln College PTK faculty advisers John Welter and June Burke welcomed the guest speaker, Lincoln College Museum curator Ron Keller. Keller gave a speech on the tragic events of Sept. 11 and what everyone can do to make a difference. Area students who qualified for membership are Kari Borowiak, Ashley Brinner, Tim Christoffersen, Miles Craig, Lisa Curcuru, Andrew Dexter, Molly Donnelly, Heidi Graff, Brock Guzouskis, Julie Halcomb, Brooke Huskins, Aaron Johnston, Teri Kavelman, Lyndsey Pickering, Jonah Rosenthal, Anna Schmidt, Clinton Smith, Joshua Twente, Joshua Utterback and Kate Winters, all of Lincoln; Nathan Dieckow, Hamilton Harmon, John Hoblit, Rich Lynch and Tiffany Sutton, all of Atlanta; Brittany Franklin of New Holland; Felicia Haak of McLean; Tamar Lyons of Elkhart; Rececca Ruben of Hartsburg; and Heather Long and Harry McMillan of Mason City.